For Chanukah this year we decided to do a spin on traditional latkes and use sweet potatoes and apples instead. This delicious combo is sweet, but not too sweet, and can be served as a side dish with pretty much any meal. 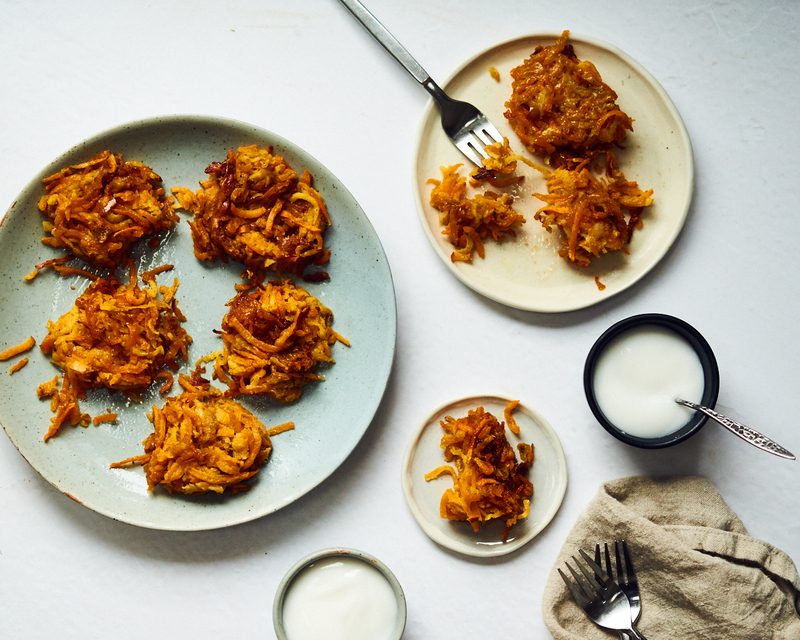 We loved pairing this recipe with dairy-free coconut yogurt; the slight bitterness of creamy, cooling yogurt was a perfect balance with the sweet potato and apple latkes. Besides swapping out the regular potatoes, we did two other things to make latkes healthier. First, we made this recipe grain free, so that everyone can enjoy latkes, even if you are gluten free or can’t eat grains. This was easy to do by using tapioca (or arrowroot) instead of regular flour. Second, we bake our latkes instead of frying them. Baking the latkes means that the oil won’t be heated to as high a temperature as when you pan fry, so the oil will not be damaged. We hope you’ll give this recipe a try! 2. Use the grater attachment on the food processor to shred the sweet potato, apple and onion. If you don’t have a food processor, you can use a hand grater instead. 3. Place the grated sweet potato, apple and onion in a mixing bowl and add the tapioca or arrowroot, along with sea salt, black pepper and an egg. Mix all together. 4. Form into small patties. We made 8 in our batch. 5. Oil a cast iron skillet liberally with avocado oil. Or, place a piece of parchment paper on a baking sheet and spread avocado oil over top. Place the latkes on the skillet or baking sheet. 6. Bake for 15 minutes. Then carefully flip. Cook on the other side for another 5 minutes. Note- these are quite delicate and can fall apart easily. If that happens, use your hands to press the sweet potato back together into a latke shape. 7. Serve with coconut yogurt or apple sauce.